As 2005 draws to a close and we look forward to the new year, I found this information on Citizens Against Government Waste. CAGW is the source of information on government waste and, backed by our members, CAGW works tirelessly everyday to win cuts in wasteful spending. As reality television shows proliferate, Congress continues to live in its own unreal world, believing there are no consequences to a steady diet of pork fat. While programs like “Extreme Makeover” take a person, family, or home and transform them into something new and beautiful, the latest round of appropriations bills demonstrates that Congress and the federal budget are in dire need of a fiscal makeover. The federal government’s expanding waistline (a record $427 billion deficit) has resulted from too many members of Congress believing that the United States Treasury is their own personal ATM. Our elected officials have let themselves go whole hog while letting down every hard-working American taxpayer. The 2005 Congressional Pig Book is the latest installment of Citizens Against Government Waste’s (CAGW) 15-year exposé of pork-barrel spending. This year’s list includes $3,270,000 for the Capitol Visitor Center; $100,000 for the Tiger Woods Foundation; and $75,000 for Onondaga County for the Greater Syracuse Sports Hall of Fame. Once again, Congress porked out at record levels. For fiscal 2005, appropriators stuffed 13,997 projects into the 13 appropriations bills, an increase of 31 percent over last year’s total of 10,656. In the last two years, the total number of projects has increased by 49.5 percent. The cost of these projects in fiscal 2005 was $27.3 billion, or 19 percent more than last year’s total of $22.9 billion. In fact, the total cost of pork has increased by 21 percent since fiscal 2003. Total pork identified by CAGW since 1991 adds up to $212 billion. The top three increases in pork from fiscal 2004 to fiscal 2005 were: Homeland Security from $423 million to $1.72 billion (306 percent); Energy and Water from $714 million to $1.88 billion (163 percent); and Labor/HHS from $943 million to $1.7 billion (80 percent). Alaska again led the nation with $985 per capita ($646 million), or 30 times the national pork average of $33. The runners up were the District of Columbia with $461 per capita ($257 million) and Hawaii with $454 per capita ($574 million). Senators have once again proven that membership has its privileges: your money. Citizens Against Government Waste (CAGW) is a private, non-partisan, non-profit organization representing more than one million members and supporters nationwide. 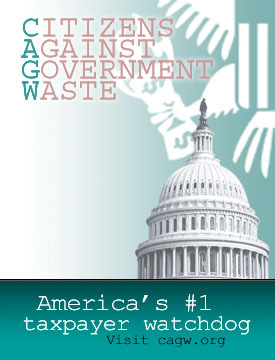 CAGW’s mission is to eliminate waste, mismanagement, and inefficiency in the federal government. Founded in 1984 by the late industrialist J. Peter Grace and syndicated columnist Jack Anderson, CAGW is the legacy of the President’s Private Sector Survey on Cost Control, also known as the Grace Commission. In 1982, President Reagan directed the Grace Commission to “work like tireless bloodhounds to root out government inefficiency and waste of tax dollars.” For two years, 161 corporate executives and community leaders led an army of 2,000 volunteers on a waste hunt through the federal government. The search was funded entirely by voluntary contributions of $76 million from the private sector; it cost taxpayers nothing. The Grace Commission made 2,478 recommendations which, if implemented, would save $424.4 billion over three years, an average of $141.5 billion a year all without eliminating essential services. The 47 volumes and 21,000 pages of the Grace Commission Report constituted a vision of an efficient, well-managed government that is accountable to the taxpayers. CAGW has worked to make that vision a reality and, in a little over two decades, has helped save taxpayers $825 billion through the implementation of Grace Commission findings and other recommendations. CAGW’s membership has grown from 5,000 members in February 1988 to more than one million members and supporters today. This phenomenal growth is the result of taxpayers’ increasing frustration with the squandering of their hard-earned money in the nation’s capital. CAGW is nationally recognized as the source of information on government waste. CAGW representatives appear frequently on television, radio talk shows, and in print. CAGW produces numerous publications highlighting wasteful government spending. Government WasteWatch is the group’s quarterly newspaper, which is distributed to members of CAGW, Congress, and members of the media nationwide. The annual Congressional Pig Book Summary is CAGW’s famous exposé of the most glaring and irresponsible pork-barrel projects in the 13 annual appropriations bills and their sponsors.